Israeli bulldozers, on Wednesday morning, demolished a Palestinian house and a number of storehouses in the East Jerusalem neighborhood of Silwan. 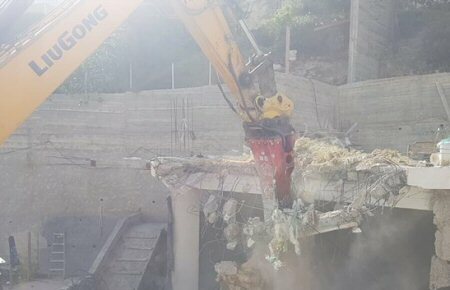 WAFA correspondence said that dozens of Israeli police cordoned off the Wadi Yasul area, in Silwan, and deployed in the alleyways, as the municipality bulldozers proceeded to demolish the house and storehouses under the pretense of being built without a rarely-issued Israeli license. Local Palestinians scuffled with police and attempted to prevent the demolition, but they were assaulted by police officers. Several Palestinians sustained injuries as a result of the police assault. The owner of the demolished structures was identified as Izz al-Deen Barqan. The demolition took place three days after an Israeli court rejected an appeal submitted by the homeowners against the planned demolition. Israeli courts, seen as the last judicial recourse against demolitions, in fact are complicit in perpetuating the Israeli policies of forcible transfer against Palestinians. Using the pretext of illegal building, Israel demolishes houses on a regular basis to restrict Palestinian expansion in occupied Jerusalem. At the same time, the municipality and government build tens of thousands of housing units in illegal settlements in East Jerusalem for Jews with a goal to offset the demographic balance in favor of the Jewish settlers in the occupied city. They are also discriminated against in all aspects of life including housing, employment and services, and are unable to access services in the West Bank due to the construction of Israel’s separation wall. Large numbers of Israeli forces raided the Silwan neighborhood, in occupied East Jerusalem, and surrounded several Palestinian-owned structures in preparation for demolition, on Wednesday. Eyewitnesses said that heavily armed Israeli forces, a number of bulldozers and Israeli Civil Administration staff raided Silwan, commencing the demolition of two Palestinian-owned structures. Ma’an sources confirmed that Israeli bulldozers demolished storage warehouses belonging to Izz Barqan. Israeli bulldozers also demolished horse stables, which measured 200-square-meters and were built four years ago. The demolished horse stables belonged to Muhammad al-Qaq. Sources added that, during the demolition campaign, Israeli forces physically assaulted Silwan residents, including women and children. Earlier this week, the Israeli Supreme Court rejected an appeal by Palestinian families from Silwan, allowing the demolition of 500 homes and commercial buildings, which were built without an Israeli-issued permit, to take place. The residents built these 500 homes and commercial buildings about 30 years ago, without the nearly-impossible to obtain Israeli permit. The Supreme Court’s decision will most probably affect the fates of hundreds of Palestinian families, who will be left homeless following the demolitions.